Amid calls from the trade unions for wage adjustments for public officers, the International Monetary Fund has issued a statement following the conclusion of its annual Article IV Consultation with Belize on June 21, 2013, in which it calls on the Government of Belize to moderate wage increases and broaden the general sales tax base. “[IMF Directors] stressed that raising the primary surplus to levels consistent with debt sustainability would require strong adjustment efforts, including moderating wage increases and broadening the base for the general sales tax. Over the medium term, it will be important to strengthen public financial management and implement a tax reform that promotes growth and fairness,” the report said. The IMF executive directors, said the report, congratulated Belize authorities on the strong economic performance last year, as well as the successful completion of the external debt exchange. “The Belize government’s completion of the exchange of its ‘super-bond’ for new US dollar denominated bonds due to expire in 2038 brought substantial cash-flow relief (about US$130 million over the next 5 years),” said the IMF statement. It added that the restructuring took place against the backdrop of prolonged legal disputes over the nationalization of two utility companies: Belize Telemedia Limited (BTL) and Belize Electricity Limited (BEL)—for which, it noted, no agreement has been yet reached over compensation payments. Notwithstanding the success with the debt exchange, the Directors said that Belize’s economy still faces substantial challenges and vulnerabilities. “They encouraged the authorities to take advantage of the existing breathing space to rebuild policy buffers, pursue active debt management, accelerate financial sector reform, and buttress the economy’s resilience to external shocks,” the report said. It also pointed to the overall economic picture, saying that output growth is estimated at 5.3% in 2012, led by a recovery from the 2011 effects of weather-related damages in commodity exports. “Despite the acceleration in economic activity in 2012, output growth is expected to moderate to about 2.5 percent in the medium term,” it said. 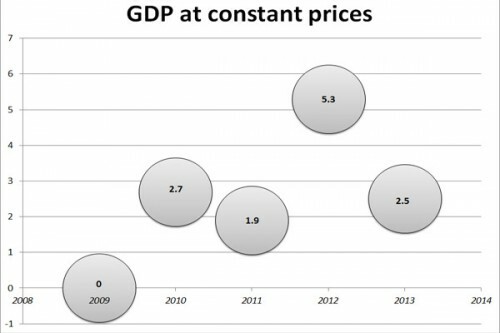 GDP growth is expected to slow to 2.5% in 2013, with the nominal GDP reaching US$1.6 billion, and unemployment remains high at 16 percent, said the IMF report. “High non-performing loans (NPLs) in the banking system—20 percent of total loans at end-2012—and loan write-offs continue to hold back private sector credit growth, estimated at 1.1 percent, and are eroding banks’ net earnings,” the IMF report said, noting, though, that new provisioning and loan classification standards implemented by the Central Bank at end-2011 have eased the levels of NPLs.